The Samsung RF28JBEDBSG (available at Abt for $3,099.00) sports unexpected features like a Food Showcase to keep your favorite items in a special door, and a configurable cold drawer that lets you set the cooling level. It’s great looking in black stainless steel, and it's also available in regular stainless as the RF28JBEDBSR. It organizes the food well and keeps its chill. You can grab your favorite foods from the Food Showcase instead of opening the doors. We spent a week testing this fridge in our labs, and we give it two thumbs up. The black stainless steel on the doors looks dashing, and it conceals fingerprints and smudges better than typical stainless steel. Black stainless, which you can also find on models by Whirlpool, GE, and LG, has complex-looking depth and richness of color. Samsung's version is especially attractive. The sides are made of textured black plastic, which is much less attractive, but may be hidden, depending on the layout of your kitchen. We liked the Food Showcase, which is a door-in-a-door storage system that makes it easy to grab the foods you use most often. A trigger in the right-side handle opens it, eliminating the need to fling open the main doors to get a quick drink or some condiments. Kids can enjoy picking out their own snacks from the Food Showcase. The FlexDrawer is a great idea—and it’s especially useful because, again, you don’t have to open the main doors to get what you want. Decide what you’d like to store there, then set the temperature accordingly. You have four choices that go from 29° (Meat/Fish setting) to 42° (Wine/Party Dishes). We think this might be a popular place to stash a few brews. 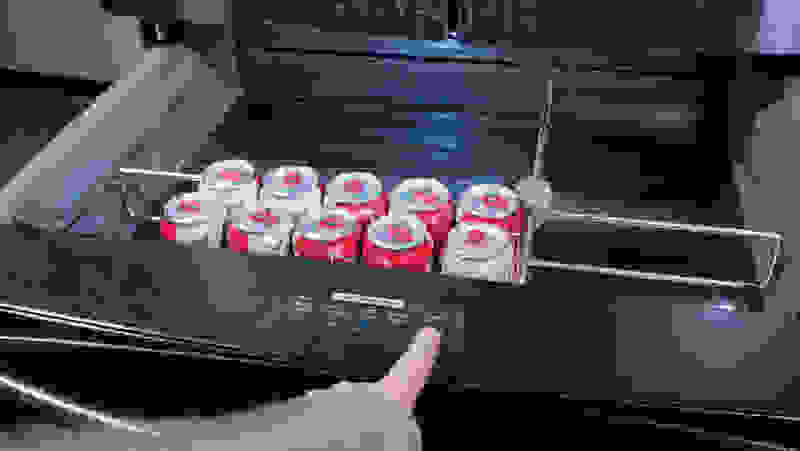 The FlexDrawer lets you set the temperature, making it ideal for storing your favorite canned beverages. The interior space is brightly lit and surprisingly accommodating. 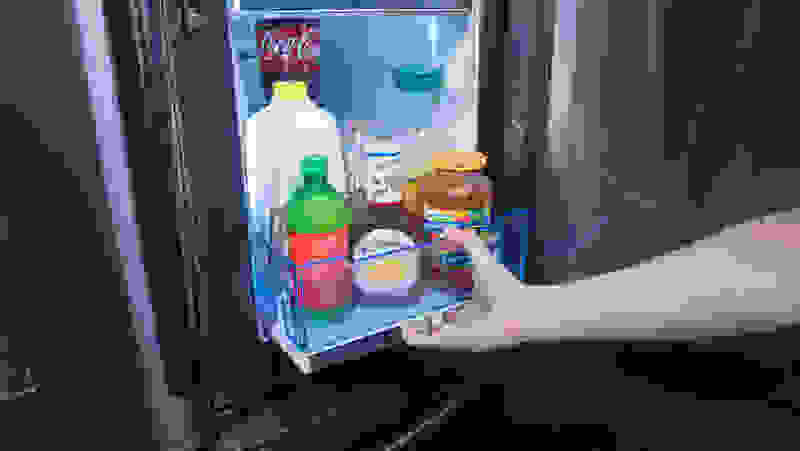 Two adjustable shelves on the cold food side are moveable to make room for taller items: one retracts, and the other folds up. Still, the icemaker design puzzles us—it takes up way too much room, leaving the shelves on the left side too small for any useful storage. Other refrigerators put the icemaker on the inside of the door instead. Between the crispers, you'll find the water filter. That location may make it easier to change when the time comes. 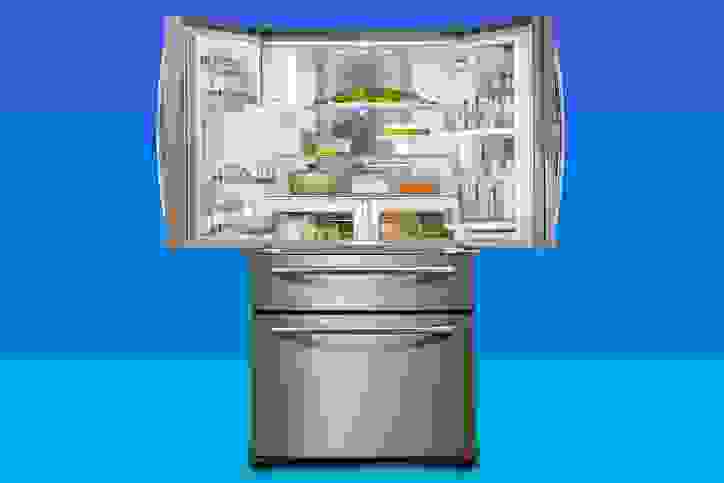 Many modern refrigerators like this one are built with two evaporators, so refrigerated foods remain fresh and frozen foods stay frozen. Our tests showed that Samsung’s cooling system works acceptably well. The average temp in the top and middle of the fresh food compartment hovers around 35°—which is fine, though 37° is optimal. There's a warm-ish spot at the bottom of the refrigerator. No worries, though, it almost never goes beyond 39°. And the interior humidity stayed consistent, preventing fruits and vegetables from dehydrating. When we tested it, the freezer drawer reached the freezing point in just an hour and 14 minutes. The average temperature at the bottom was about 0° and the top of the freezer averaged about -2°, plenty cold. Bright LED lights illuminate the interior of the fridge. If efficiency is a high priority for you, this fridge will cost just over $41 a year to run, not the least expensive, but still okay. Most owners love the refrigerator’s design and functionality. Some complain about the icemaker’s limited capacity, and a few people experienced clogging issues with the icemaker. This refrigerator has some ingenious features, and we can’t argue with a fridge that provides so many storage choices, keeps food safely cold, and looks totally contemporary. Samsung has embraced the concept of flex with their FlexWash and FlexDry for laundry, and now, the FlexZone Drawer in this fridge, which lets you set your choice of temperature in the cold drawer. It’s a cool feature. Just think of “flex” as a synonym for “luxe” when you decide whether this refrigerator is right for you. 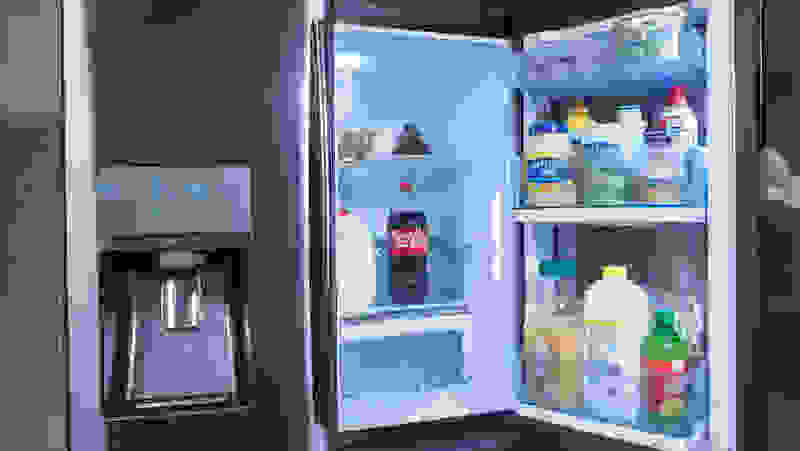 If you're looking for a fridge to compare it to, we love the GE Café CFE28TSHSS. It won't give you the fourth door, or the hidden compartment, but it has great looks and contemporary features, and you can buy it for about the same price as the Samsung.